Mesh gaskets are constructed of knitted mesh wire. The metal mesh material can be SnCuFe (tin-plated copper-clad steel), Monel (nickel-copper alloy) or aluminum. The most common wire materials are Monel, which combines excellent EMI/RFI protection, high resistance to oxidation, high tensile strength and resiliency, and SnCuFe, which offers best shielding performance at lower frequencies, especially with respect to magnetic fields. Aluminum mesh is occasionally used when the mating surfaces are aluminum. 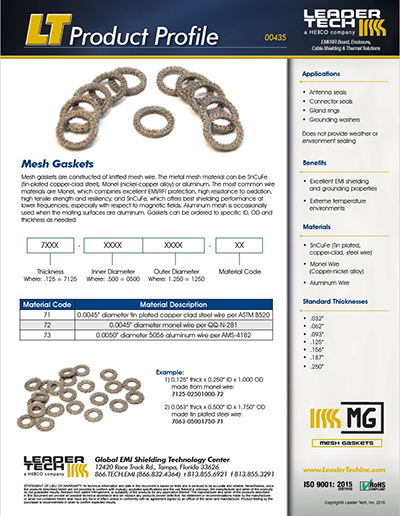 Gaskets can be ordered to specific ID, OD and thickness as needed.